Can you survive the dip on the 24 ft mistic mountain water slide? One of several 24ft slides we have in our inventory! 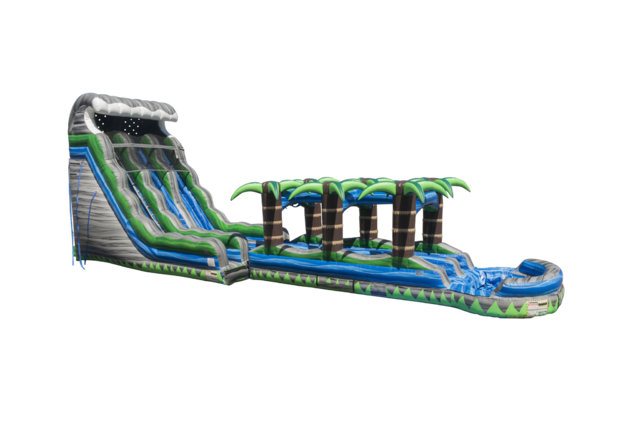 This water slide rental is the best looking slide in the area! With a seated platform height of 18ft this is one of the largest slides in southeast Georgia! Nothing compares to this slide! Brave the climb to the top and ride the wave down the double lane slide through the slip n dip to the pool over 60ft in length! This slide is HUGE. Great for all ages from kids all the way up to adults! If you're looking for the ultimate in party fun and something that will leave your guests talking for weeks after, than this is the slide for you! We provide clean, on-time water slide rentals for our customers. Looking for the best in inflatable rentals? Let us help make your next event the BEST EVENT EVER!